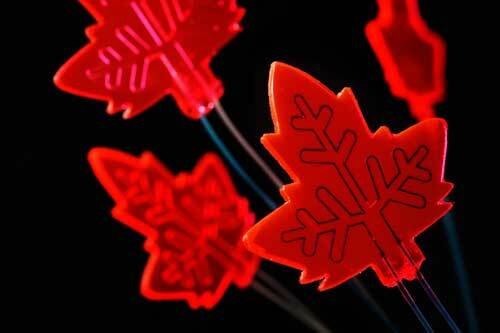 (Nanowerk News) To produce drugs sustainably and cheaply, anywhere you want. Whether in the middle of the jungle or even on Mars. A 'mini-factory' whereby sunlight can be captured to make chemical products. Inspired by the art of nature where leaves are able to collect enough sunlight to produce food, chemical engineers at Eindhoven University of Technology (TU/e) have presented such a scenario. They describe their prototype reactor - consciously shaped as a leaf -in today's journal Angewandte Chemie ("A leaf-inspired luminescent solar concentrator for energy efficient continuous-flow photochemistry"). Using sunlight to make chemical products has long been a dream of many a chemical engineer. The problem is that the available sunlight generates too little energy to kick off reactions. However, nature is able to do this. Antenna molecules in leaves capture energy from sunlight and collect it in the reaction centers of the leaf where enough solar energy is present for the chemical reactions that give the plant its food (photosynthesis). The researchers came across relatively new materials, known as luminescent solar concentrators (LSC's), which are able to capture sunlight in a similar way. Special light-sensitive molecules in these materials capture a large amount of the incoming light that they then convert into a specific color that is conducted to the edges via light conductivity. These LSC's are often used in practice in combination with solar cells to boost the yield. Watch an animation of the artificial leaf. While the reaction they chose serves as an initial example, the results surpassed all their expectations, and not only in the lab. "Even an experiment on a cloudy day demonstrated that the chemical production was 40 percent higher than in a similar experiment without LSC material", says research leader Noël. "We still see plenty of possibilities for improvement. We now have a powerful tool at our disposal that enables the sustainable, sunlight-based production of valuable chemical products like drugs or crop protection agents." For the production of drugs there is certainly a lot of potential. The chemical reactions for producing drugs currently require toxic chemicals and a lot of energy in the form of fossil fuels. By using visible light the same reactions become sustainable, cheap and, in theory, countless times faster. But Noël believes it should not have to stop there. "Using a reactor like this means you can make drugs anywhere, in principle, whether malaria drugs in the jungle or paracetamol on Mars. All you need is sunlight and this mini-factory."